Orginal Green Cell ® Charger with 2.. Car Charger 3 USB Quick Charge Green.. Car charger USB-C Power Delivery + USB..
Green Cell USB-C 60W Charger PD with..
Advanced protecting electronics, modern design, small sizes and universality make Green Cell Adapter irreplaceable if you want to extend your device’s possibilities. Change one slot into 7 and enjoy yourself with unlimited possibilities of e.g. transmitting data, pictures and fast charging by a single device. Green Cell Adapter is a perfect solution for using many different ports at the same time. It will be the most suitable for users of the newest Apple MacBook, Chromebook and Zenbook – the only models equipped with the latest USB-C slot. Application of the most popular on the market inputs allows you to change your USB-C port into e.g. 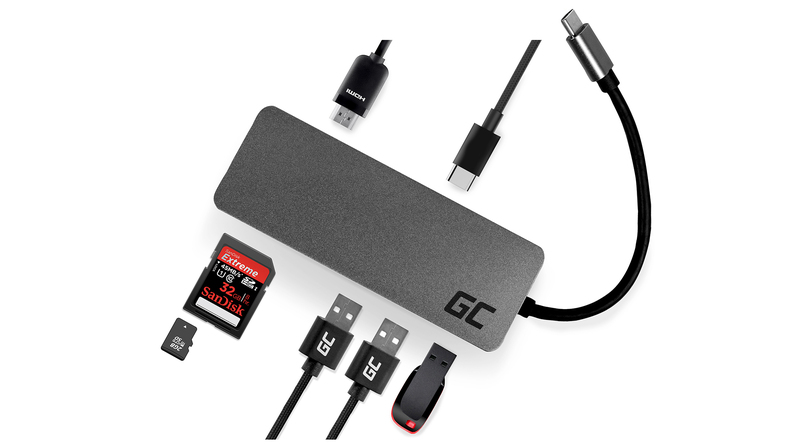 fast charger, memory cards’ reader, 4K photo transmitter or a connector for standard USB-A devices. Additionally, it can replace DeX station and other PC Mode systems e.g. Samsung Galaxy S8/S9, Note 8 or Huawei Mate 10 which enables you to use your smartphone as easily as your computer. Adapter has 7 outputs extending the device’s functionality. And that all is closed in a compact, unibody case in size of 30mm x 109mm x 12,5mm. Samsung DeX enables you to connect Galaxy S8/S8+, S9/S9+ or Note8 to the screen, keyboard or to the mouse and use it as an efficient mini-computer ready for work. You have to simply connect your phone and charger to the Green Cell adapter and the system will start automatically. Now, in personalized computer interface, you can use applications, view documents, create graphics and many, many more. At the same time all phone functions are available. Power Delivery technology allows you to use Green Cell adapter as a charger by pass-through system. It is enough to connect the charger to the adapter and electronics will automatically sets parameters appropriate to charge your device. USB slot available in our device supports fast charging technology, which makes charging even 4x faster. This USB C hub is good quality and working well on my MacBook. Small and convenient to take it with me. And the speed of transporting documents is fast. Moving to a new Macbook I felt pretty constrained on ports. This fixed that and gave me better connectivity than my old Mac. Altogether a better upgrade than USB C only system makers are selling right now. I use this everyday and it's so perfect to transfer and take things from my Dell XPS laptop. I never regret buying this. Is a very good product and has a good quality, I definitely recommend it. Does what it needs...very versatile! Great little adapter for my Surface Go. Been able to connect to all sorts. Very good product. Allows me to use my existing peripherals on my HP Spectre which only has one USB port otherwise. Blends in colourwise too.